The power of iClone real-time 3D filmmaking is seen clearly inside the 3D viewer pane which displays the current camera view and is also your workspace when creating an iClone project. Please scroll down to this page or refer to the Keyboard Shortcuts for more details about camera movement directly using mouse operation. The following hotkeys are used on the 3D view window. Press down and drag in the 3D viewer can roll the view on X-Z plan. Snap the camera back to the upright position. Scroll the roller on the mouse to zoom the 3D viewer free camera in and out. 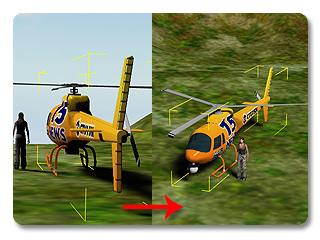 Pressing the right and left mouse buttons speed zoom the 3D view in and out . Press F to switch the selected object (character, accessory, prop) face front . 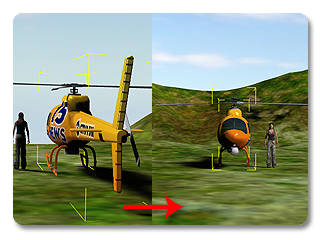 Press Home to snap the camera to the 45 degrees perspective to the selected object (character, accessory, prop). Lock Dynamic Camera to character.